Waseda Jitsugyo slugger Kotaro Kiyomiya hits a two-run homer in the third inning against Tokaidai Kofu on Saturday at Koshien Stadium. The Yomiuri Shimbun NISHINOMIYA, Hyogo — In one of the most highly anticipated moments of the tournament, the near-capacity crowd followed the high arch of the ball as it made its way into the stands. 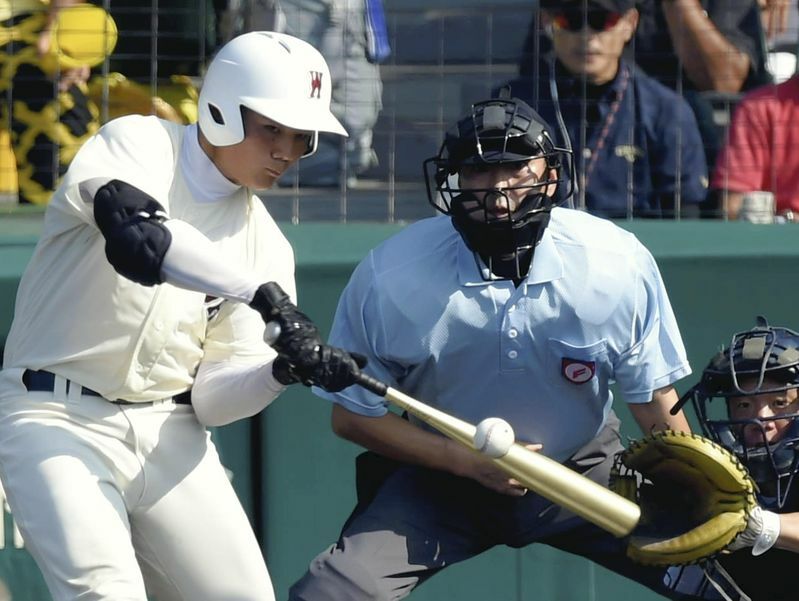 First-year phenom Kotaro Kiyomiya delivered his first homer at Koshien Stadium, helping lift West Tokyo’s Waseda Jitsugyo to an 8-4 victory over Tokaidai Kofu of Yamanashi to advance to the quarterfinals of the National High School Championship on Saturday. Kiyomiya, who drove in five runs, stepped into the batter’s box in the third inning with no outs, a runner on first and the score tied 1-1. After getting two strikes, the Tokaidai catcher set up for a pitch outside of the strike zone, but starter Hiroki Kikuchi’s fourth pitch went right down the middle. Kiyomiya sharply hit the pitch, smacking a towering shot over the right-field fence. Masaki Kato followed with a solo homer to make it 4-1. “I had a good concentration. I’m really glad I hit a homer,” said a grinning Kiyomiya.